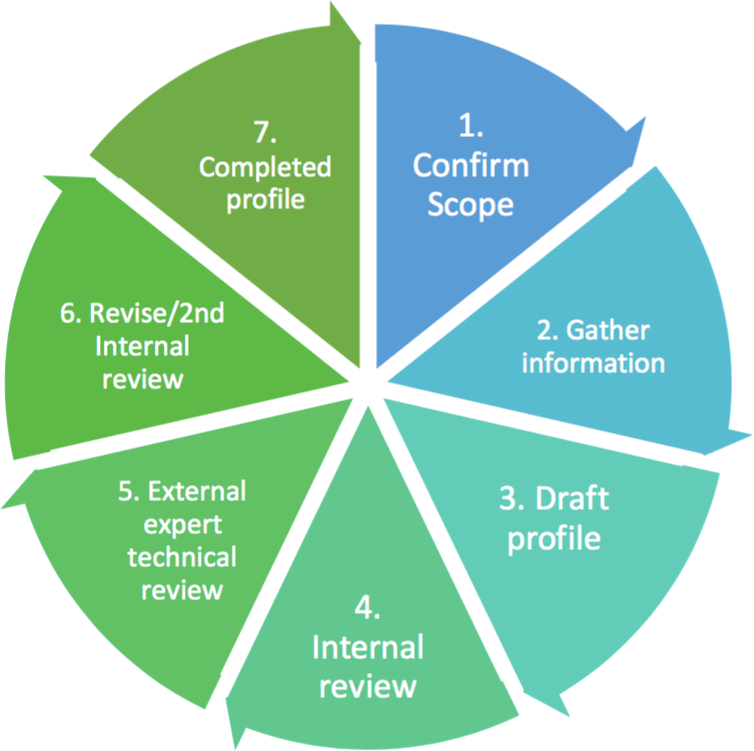 Analysts follow a robust process of data collection, analysis, and assessment to produce a fishery profile (see Figure 1). The process includes gathering credible, publicly available evidence of forced labor, human trafficking, or hazardous child labor in the profile fishery and a country’s fishing industry. Analysts also assess if the country meets the Risk Tool’s country criteria. Figure 1. 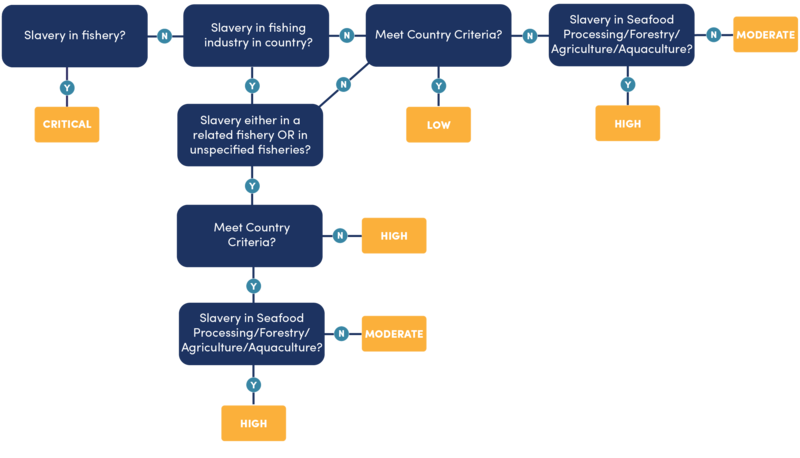 The Seafood Slavery Risk Tool's fishery profile development process. Evidence of forced labor, human trafficking, or hazardous child labor in a country’s seafood processing, forestry, agriculture, and aquaculture industries may be examined as indicators of risk for the at sea portion of a fishery. See the Seafood Slavery Risk Tool’s conceptual model below to view which pathways trigger an examination of related industries. The Risk Tool’s rating only applies to the profile fishery. Ratings are not produced for countries. All profiles undergo a rigorous review process, including by external experts. Read Seafood Slavery Risk Tool Methodology for further details about the fishery profile development process. Media reports and investigative journalism. Evidence that’s more than  10-years old at the time of publication will not  be used  for rating though it may be noted to provide  additional information. Newer evidence takes precedence unless it’s deemed invalid. Original research and investigative findings are used over sources that quote them. If a source relies solely on another that’s more than 10-years old, it will not be used for rating. Sources must contain factual evidence. Opinion pieces are not considered valid sources on their own, but they may be noted if other credible, evidence-based sources corroborate the viewpoints. If sources contradict each other, the most commonly cited source or fact will be used. If sources are ambiguous, inconsistent, or don’t contain sufficient detail to relate them to the fishery or fishing industry in question, the sources will not be used for rating. The sources may be noted for additional information, however. More than one source is preferred. However, this may not be possible given the relatively limited research and investigation in this field. If a risk rating is based on a single source, the analyst will carefully evaluate the source and provide remarks on its credibility in the fishery profile. When sources lead analysts to conclude that a fishery’s rating could follow more than one risk rating path (that may or may not result in different ratings), the reasoning and justification for the final risk rating will be thoroughly explained. Fishery profiles are reviewed by external experts who are asked, among other things, to assess the credibility and validity of the sources. Critical Risk – Credible evidence exists that forced labor, human trafficking, or hazardous child labor occurs in the profile fishery. There’s credible evidence in fisheries in the country. There’s no evidence in fisheries, but the country doesn’t have sufficient regulatory protections and/or enforcement, and there’s evidence of forced labor, human trafficking, or hazardous child labor in related industries (i.e., seafood processing, agriculture, forestry, and aquaculture). There’s no evidence in the profile fishery or related industries. The country may or may not have sufficient regulatory protections and/or enforcement, and there may or may not be evidence of forced labor, human trafficking, or hazardous child labor in the country’s fisheries. Low Risk – There is no evidence in the profile fishery or related industries, and the country has sufficient regulatory protections and enforcement. The below conceptual model illustrates the paths to critical, high, medium, or low risk. Read Seafood Slavery Risk Tool Methodology for further information. Figure 2. Conceptual model illustrating the different pathways to critical, high, moderate, and low risk. A fishery defaults to LOW risk if it’s Fair Trade U.S.-certified or direct evidence of supply chain due diligence is provided. In addition, if there are vessels within a Risk Tool-rated fishery that are registered with a vessel-based accreditation program that requires decent working conditions for crewmembers , the vessels are exempt from the fishery risk rating and rated LOW risk.